Our first day in Cambodia began at the fairly reasonable hour of 7.30am. Luckily the Coffee Fairy had flown in with me and was on duty (see earlier posts) which made the daunting task of waking up and staggering down to breakfast a little easier. Our Khmer guide Manay was waiting for us at reception and with a peremptory wave of his hand he summoned our tuk tuk for the day’s excursion. 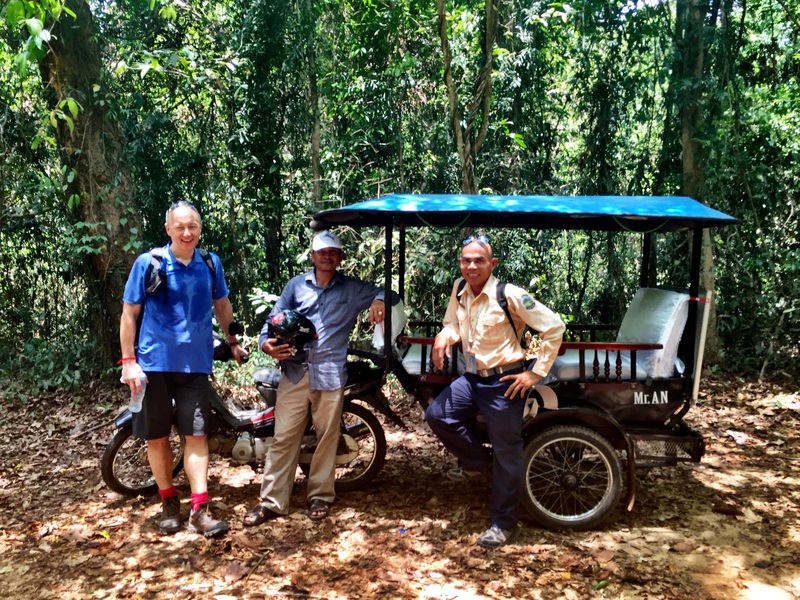 The tuk tuk, driven by its owner Mr An, was extremely smart with frilled, white satin cushions and a cool box filled with bottles of cold water and jasmine scented cold towels to wipe our hands and faces after each temple visit. Husband of course insisted on giving himself a full flannel bath whenever he was handed one of these towels much to the amusement of Mr An. We set off into the morning rush hour of Siem Reap. The roads were buzzing with hundreds of mopeds, tuk tuks, bicycles and the occasional car and pretty quickly we realised that there are no road markings, no give way signs or traffic lights at any junction or intersection. All the drivers just go for it, keeping a close watch on everyone else and weaving in and out of each other. It is all done with great good humour and politeness and there is very little hooting. The mopeds generally had more than one occupant and I regularly counted four and once five people on board, including two small children. Mr An carefully wove his way through the apparent chaos and after twenty minutes we arrived at our first stop. 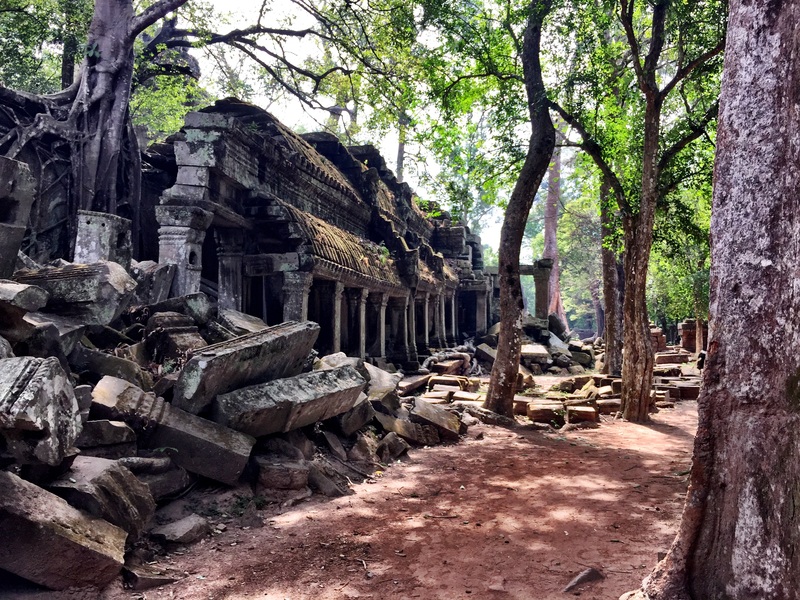 I have wanted to visit the temples of Cambodia ever since Lara Croft in Tomb Raider crept through the ancient stone door which was overgrown with unworldly looking tree roots, and the first temple on our itinerary was the very same one. Ta Prohm is amazingly well preserved with wonderful doorways and corridors still intact. The element that makes it unique are the four or five Spung trees which have insinuated themselves between the giant blocks of stone and whose roots resemble the tentacles of some giant alien. Above us in the uppermost branches were five or so enormous beehives, hanging like brown banners, each at least two metres long. After fully exploring Ta Prohm we climbed back into the tuk tuk and headed off to a much less visited temple called Ta Nei. It is down a dirt track only accessible by bike, moped or tuk tuk so the tour buses don’t reach it. We were practically alone as we clambered over giant fallen blocks of stone and walked through passageways full of ancient carvings. By this time, the temperature must have hit 38 degrees C and Husband made full use of the cool towels and water offeredby Mr An on our return to the tuk tuk. The next temple was much larger and had been well restored by the chinese. We decided to climb the ancient stone staircase to the top which frankly scared me to death. All the temple stairs that we encountered in Cambodia are very tall and narrow so you have to go up and down sideways. It also makes them extremely steep and the staircase in this temple was at least 20 metres high. Going up was nervewracking but worth it. We scrambled to the top to find an amazing view of the jungle and we were able to visit the towers on its summit. In one we found a golden Buddha and a little old man who offered us some incense to burn. Having paid our respects it was time to gird our loins and go back down the near vertical stone staircase. Husband and Manay started down apparently unmoved by the fact that any misstep would lead to instant death. I on the otherhand, had to descend like an arthritic crab, shaking and clutching onto the stone blocks at the side, trying not to look down. After what felt like hours, I reached the bottom in one piece albeit with very wobbly legs and was feeling extremely proud of myself when Manay mentioned conversationally that monks in their seventies would think nothing of zipping up and down the same staircase on a daily basis when the temple was in use. In all we saw five temples that day. Each different from the last but still staggering in their scale and state of preservation. It had been hard work climbing steep steps and scrambling over ruins and even Husband was looking a little wilted when the tuk tuk suddenly veered off the road and after bumping down a dusty track came to a stop on the banks of the enormous moat that surrounds the ancient city if Ankor Thom. Manay motioned us towards a gold leaf adorned gondola with our own pilot who would scull the boat along the moat as we sat under a small awning. 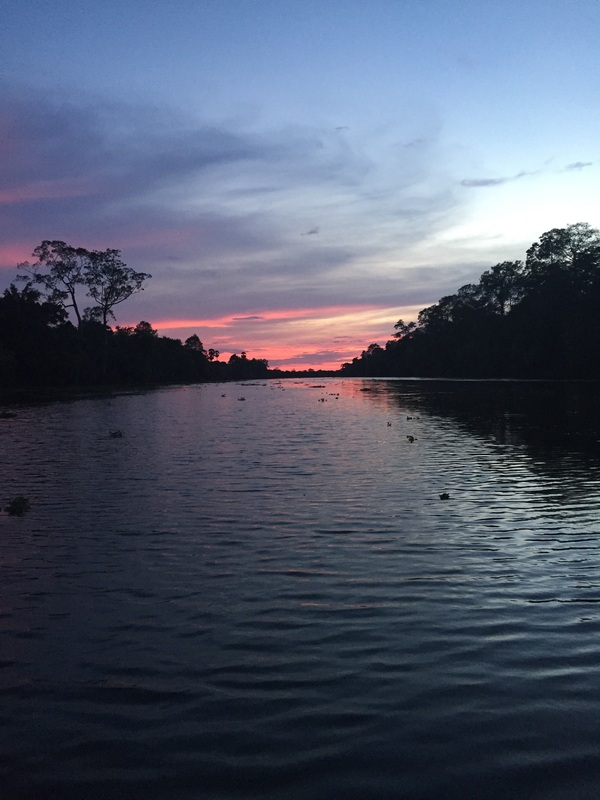 As the sun set over the water, a million cicadas began to sing and Manay handed me a stiff gin and tonic and Husband a cold beer. It was the best possible end to an extraordinary day. We landed in Bangkok after a fairly uneventful flight apart from endless hours of turbulence. Husband as usual slept through it all, snoring delicately while I clutched the armrests and whimpered whenever we hit a particularly vicious air pocket. We breezed through immigration and baggage reclaim and were whisked to our hotel in an airconditioned van, weaving in and out of the gaudily coloured tuk tuks and shocking pink taxis until we arrived at the Hotel Siam right on the Chao Phraya river. Stepping outside is exactly like stepping into a steam room fully clothed. I thought Madrid was hot in July, but it has nothing on Bangkok in May! Luckily our hotel was fully air conditioned and after Husband had gone to the gym and I had accidentally fallen asleep while checking my emails, we jumped on the hotel’s boat to take us to dinner. The restaurant had the rather unprepossessing name of Steve’s Bar but had been recommended as a good local Thai eatery. Husband’s head began to loll as we sped up the river, inspite of the amazing view and my sharp intakes of breath due to a few near misses with small ferries and a couple of enormous barges. Steve’s Bar turned out to be a rickety shack on the river bank and after clambering off the boat, we left our shoes outside the door with thirty other pairs and sat down to some outrageously good pad thai and even some wine. The next morning we were picked up by our smiling guide Ta, who made sure that we were correctly dressed for visiting the temples with covered shoulders and over the knee dresses for the women. Luckily you can rent a sarong if you only have shorts. We began the day at Wat Pho and after buying our tickets crept into one of the temples where sixteen monks were chanting. 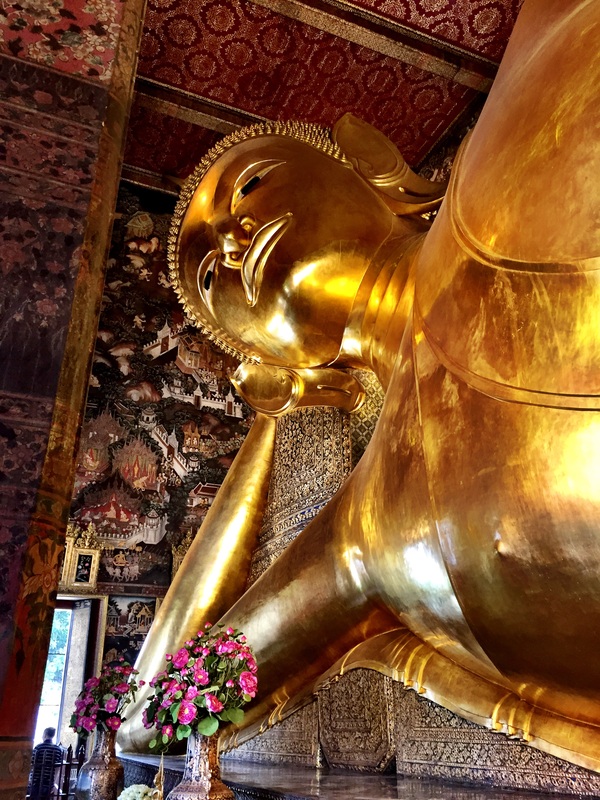 They sat to one side on a slightly raised area facing the stunning golden Buddha. The complex of Wat Pho was delightfully empty and it was easy to appreciate its extraordinary beauty. Around every corner is a gallery of golden Buddhas or an exquisite statue or temple. Gold leaf is used everywhere and the level and intricacy of the decoration is astounding. Our next stop was the Grand Palace but in contrast to Wat Pho it was heaving with people. The majority were groups of chinese who were clutching a forest of umbrellas against the sun and selfie sticks. Ta squared her shoulders and warning us of the danger to our eyes from the umbrella spokes, forged a path through the masses, batting at the odd aggressively wielded umbella or obtrusive selfie stick. She even told off a young american woman who had bared her shoulders. “But it’s sooo hot!” complained the tourist, to which Ta replied “Yes, well we are all hot. Cover up!”. Once we got used to the crowds, the Grand Palace was no less beautiful and we enjoyed Ta’s tales of the various kings who had built it and the mythical creatures that are depicted on the walls. Our visit to the Emerald Buddha was greatly enhanced by the spectacle of the diminutive doorman smacking a tall american man on the bottom with his sign for inadvertently sitting on a donation box. Leaving the Grand Palace, we walked in the punishing heat through a bustling market to the river and jumped into our own long-tail boat for a trip along the Klong which is a canal that becomes quieter and more peaceful the further along you go. We passed small floating markets with women cooking and selling food from their tiny boats to the local people doing their shopping. Then as the canal became narrower, we saw ramshackle wooden houses on stilts often leaning precariously over the water while their inhabitants went about the daily business of cooking or washing. At one point an enormous monitor lizard sat on a wall sunning itself as we chugged past. We just had time to visit Wat Arun with its marvellous spires covered in chinese porcelain and rows of chinese lions. Ta then took us back to the river where we caught a ferry to the opposite bank and made our way to a restaurant. Lunch consisted of a delicious green curry in an air conditioned restaurant back on the bank of the main river which felt like the height of luxury after the gruelling heat outside. We had time to properly cool down and rehydrate before we said goodbye to Bangkok and Ta took us to the airport for our onward flight to the next part of our trip, Siem Reap in Cambodia. After many years of drinking coffee in the morning I have passed the point of denial and can freely admit I am addicted. The ironic thing is that I used to loathe the taste of coffee and only started drinking it to thaw out my hands after riding outside in sub zero temperatures in winter. One thing led to another and now 20 years later it is the first thing I crave in the morning apart from another couple of hours sleep. There is now a well established protocol which involves me blearily checking my watch as I try to surface from the depths of slumber at what I consider an ungodly hour, while the Coffee Fairy formerly known as Husband, cheerily bustles round the bedroom and asks if I would like a cup of coffee. This is generally met with an affirmative grunt unless it is before 6am in which case it is met with a groan. There is an understanding that the Coffee Fairy does his job in return for certain favours which sounds rather exciting but normally means sending anything he has forgotten to the office or taking his road bike to be serviced. This first shot of caffeine is completely necessary to turn on the lights in my befuddled brain and get the show on the road. It is quite a small dose as it is always instant coffee with a splash of milk. However, once the Coffee Fairy has fluttered off to the office, I have had breakfast and walked the dog, it is time to proceed to the main event. Every weekday at 8.50am, I drive to the local cafe and order myself a cafe con leche (long on coffee and short on milk), sit down with one of my closest friends and discuss our children, potential business opportunities, the state of the world and the length of our to do lists. This takes about an hour and we normally get through two coffees each. This doesn’t seem like much, but two cafe con leches packs a mean punch and over time my body has come to expect it. If for any reason we only have time for one coffee, the morning seems perfectly normal but I don’t seem to make much headway with my usually endless list of errands and I have noticed that everything from filling up with petrol to writing emails seems to take longer. A two coffee morning, on the other hand, seems to fly by with me manically driving from errand to errand, talking 30% faster than I would normally and zipping round the supermarket in record time. There have been mornings when for reasons seemingly beyond my control such as meeting another friend after my usual coffee stop, I have had three cafe con leches. This unfortunately crosses the line of what my body is prepared to put up with. On three spanish coffees, I am unable to stop talking, I drive everywhere over the speed limit and my whole body seems to hum. The good side is that my kilometric to do list is normally taken care of by 11am. The downside is that anyone ringing me up to arrange to come and fix the washing machine will get my entire life story and later I am unable to get to sleep until about 2am probably because my heart rate is double what it should be. The opposite problem to too much, is too little. These are the times when for whatever reason I don’t get my caffeine fix in the morning. This does happen sometimes if Coffee Fairy is away or I am in London. Life will appear to carry on as normal but by 3pm I start to get a pain behind my right eye and by 5pm my eye is twitching and I am in the throws of the headache from hell. It is about this point at which I realise my foolish error but by then it is too late in the day to remedy the problem with a coffee so a large ibuprofen has to suffice. Every so often I consider going on a detox and joining the ranks of sensible people who sip herbal teas and are probably fifty times healthier than I am, but frankly I enjoy the buzz that my coffee addiction gives me and as long as I get the dose right I think it is a positive contributor to keeping the household running smoothly. It also keeps the Coffee fairy on his toes which has got to be a good thing. As I stood this morning, monkey wrench in hand, taking apart the boot of my car to gain access to the battery, I began to think about the distribution of the jobs in our household. It has always been a fairly traditional setup with Husband going out to bring home the bacon and me staying at home with the children, but over the years I have noticed a certain mission creep in terms of the jobs I am doing around the house. We have always jokingly called them pink jobs and blue jobs. For instance, taking out the rubbish has always been a blue job and chauffeuring children to parties has been a pink job and that has always worked fine. But lately things seem to be getting a bit mixed up. Only a couple of days ago, I found myself at the local building supply yard buying cement, sand and discussing how many bricks we were likely to need for a job we are having done in the garden. Husband meanwhile was busy at his pilates class. Admittedly it is a special class for triathlon training but you see my point? I am now the person who knows how the central heating works, and how to restart the boiler, how to programme the various electrical devices such as smart TVs, the garden irrigation system and how the pool pump works, I even do the basic car maintenance. On the other side of the equation, Husband is much more sensitive to general order and tidiness around the house while I am much more laissez faire, probably because I am either under the bonnet of a car or wrestling with a deviant sprinkler. He is a whizz at booking flights and making travel arrangements while I would leave everything till the last minute and it would all cost twice as much if it was left up to me. He is also always happy to walk our extremely energetic dog. It really doesn´t make a huge difference who does what, but it did occur to me that if I dropped off the face of the earth, life at home could become a little difficult for Husband. After years of trial and error, not to mention dealing with droves of extremely sexist Spanish builders and repair men, I can now hold my own in discussions relating to the relative efficiency of condensing boilers versus heat exchange pumps and such gems as how often to change the sand in the pool filter. The only thing I have flatly refused to get involved with is the use of the chainsaw. I now have years worth of accumulated knowledge of how to keep all the various pieces of machinery in our lives running smoothly. Where and when to kick them, how to dismantle and try to fix them and when to give up and call a technician from the endless list on my phone. I suspect that if I was not around, most of the appliances would go on strike as they are used to being gently coaxed to work on a regular basis with each machine requiring a slightly different approach, not to mention the enormous numbers of different products they all need, from specialist hoover bags to ph reducing agent. It probably makes sense for me to start compiling some form of house crib sheet incase I am away and the automatic gate won’t open or the lawnmower overheats. Actually I should write a book with chapters, detailed diagrams and encouraging text. That way, if I go on a week long silent retreat or stressbusting yoga holiday, I won’t return to a post apocalyptic scene with Husband surrounded by piles of smoking machinery. But even if I do, I know the house will be spotless, the summer and Christmas holidays will be planned and booked and the dog will have been walked off his feet. This morning as I paid our deposit on our summer holiday I realised that it was time to check up on the family’s travel vaccinations and see whether we need any top ups or new ones. Getting injections is nobody’s idea of fun but I have to say that as a family we are particularly pathetic about it. Husband blames it on me as he says that the “cowardice in the face of needles” gene comes from my side of the family and I am afraid he is probably right. Apart from falling off a chair once during a blood test (I didn’t actually pass out), I am fairly stoic about being injected. Although I have to admit that while I sit, waiting to be called in, the urge to bolt can be almost overwhelming. I imagine myself saying, ” I am so sorry, I think I left the bath running. I will be back in a few minutes,” and then hightailing it out of there, never to return. My brother and sister on the other hand, are fainters. They have both passed out during or after their vaccinations on numerous occasions. Every time my long suffering mother would warn the doctor or nurse that they would probably faint, the response would be “Nonsense, they will be fine!”. This would be followed by silence as the jab was given and then a thud or a crash as one or other of them would hit the ground or a trolley full of medical equipment. Once my sister passed out on top of my mother (who is only 5′ 1″) after removing her newly pierced earrings and nearly swashed her like a bug. So I suppose it was to be expected when my own little darlings were less than brave when injection time came around. When Teenage Daughter was about eight, she needed a blood test and I decided to take her to the doctor first thing in the morning with her brother, foolishly thinking that I could drop them at school straight afterwards. We were the first to arrive and as we went in to the “extraction room” my heart sank. Instead of the usual smiling nurse there was a very grim faced woman setting up her things. Surely the sensible thing to do with a nervous child is to talk to them and hide the enormous needle and syringe you are setting up? But no, this sadist waved the injection around in front of Small Daughter who had begun edging towards the door. Suddenly, with no warning the nurse grabbed her arm and began hitting it, obviously trying to raise a vein. Daughter squeaked and tried to pull her arm away, to no avail. The nurse swiftly inserted the needle while Daughter began to shriek like a tea kettle. Small Son looked on in horror and after putting his hands over his ears, ran out of the room into the waiting room full of people shouting “no, no, noooo..”. The blood letting seemed to go on forever but after what was probably only a minute, the nurse finally took out the needle. Daughter kept on roaring and as we passed back through the group of people waiting their turn, I could see a desperate father trying to stop his own son from running off after hearing the sounds of horror coming from the extraction room. As we left, the receptionist suggested that I ring ahead next time so that they could arrange for us to have the bloodtest/injection in a room further away from the waiting room so we wouldn’t upset the other patients. After that, instead of taking the children straight into school, I took them for an extended hot chocolate and croissant stop, to calm all our nerves. Ever since then, any form of injection is a major drama with the need for bribes or threats to get either child to the doctor’s surgery. Things are a bit easier now they are both at boarding school because if they need a vaccination, they are whisked off to the “San” with their friends for support (much more effective than Mother) and I just get the recriminations, moans about painful arms and gruesome details on Skype. I have to admit that I was pleased when one of my friends complained over coffee that two out of three of her brood had passed out at their last vaccination and she had been forced to hang around the doctor’s surgery with them for over an hour to make sure it wasn’t an adverse reaction, while trying to explain to the nurses that this was a fairly normal occurrence. It is nice to know we are not alone in our fear of needles and I live in hope that Teenage Daughter and Son will grow out of it, but I suspect that is wishful thinking as I am still waiting to grow out of it myself. Mustard our prize double-yolker laying hen is moulting. The household has been thrown into gloom as that means our daily three or four eggs will drop to two or three if we are lucky. We are relatively new to keeping chickens and last year, when our skittish white spanish hen Bustle suddenly lost most of her feathers, stopped laying and looked like she needed a month at an expensive spa, we thought that her days were numbered. Luckily after some swift research on Google, we realised that she wasn´t suffering from some appalling chicken ailment but was just updating her look with a new and pristine set of feathers. The whole painful episode is called Moulting and is the chicken equivalent to having a really bad hair day for about two months. 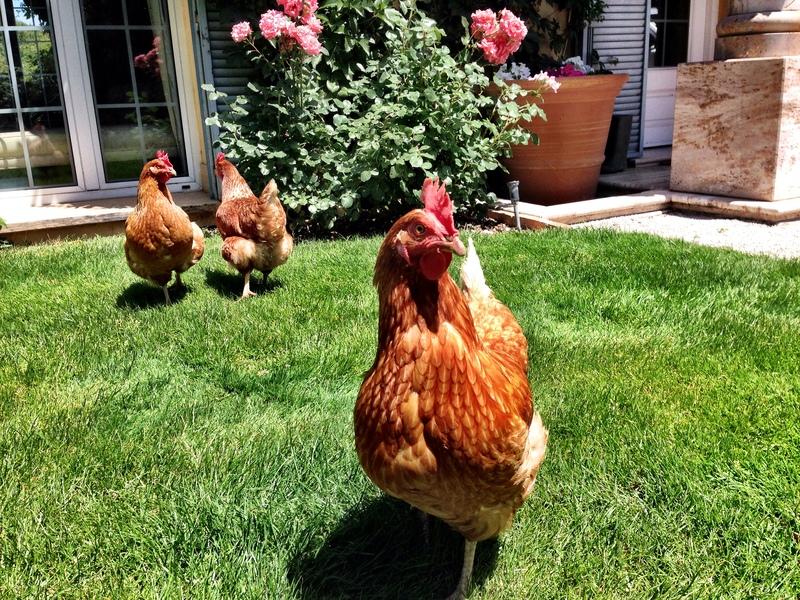 It starts with the sudden appearance of a lot of feathers strewn around the chicken coop. At first we thought the other ¨ladies¨ had been picking on her, which had happened a year earlier when she had been the new girl in the coop. We had been told that it was important to introduce a new chicken to a flock at night when the rest of the ¨ladies¨were fast asleep. That way when they awoke in the morning they would think that the new girl had been there all along. I was highly sceptical of this plan because our other hens are brown and Bustle is a luminous white. She wasn´t exactly going to blend in. Nevertheless, Teenage Son and I crept out when it was pitch black carrying Bustle in our cat carrier and sneaked up to the hencoop. The other three hens were fast asleep balancing on the perches so we carefully opened the cat carrier door and tried to extract Bustle and put her on a perch. She had been gently dozing and when she was rudely awakened by a large hand trying to drag her out of her bedroom, she began to squawk and cling on to the edges of the carrier door. Teenage Son and I had been whispering quietly so as not to wake the other hens but that quickly became impossible as we wrestled with an outraged hen that refused to be rehomed. Meanwhile the other hens were starting to stir and as Teenage Son whispered desperately ¨she won´t let go!¨ I said ¨just gently but firmly pull her out and shove her in the coop¨. There was a moments silence as he pulled against the straining hen who was clinging onto the edge of the door and then her grip slipped and he pushed her into the coop. All hell broke loose. Bustle flapped and squawked wildly and promptly knocked the other chickens off their perches. Convinced that the local fox was paying them a visit, they became hysterical and flew around the coop in panic. “That went well” said Teenage Son as the flapping and shrieking continued and we ran back to the house bent double with laughter. After her awkward introduction, poor Bustle had to put up with being at the bottom of the pecking order (the saying really does come from chickens) and her plumage suffered for a couple of weeks as every time she offended her flock mates they would mercilessly pull out some feathers which would blow around the coop. Moulting, on the other hand, involves the loss of nearly all the feathers until the chicken looks like it has escaped from someone´s oven. At one point, Bustle had no tail at all apart from a small pink nub. As well as the indignity of losing their feathers, a chicken in moult stops laying eggs. This can go on for months and with Bustle the egg yield suffered to the point where Husband would mutter darkly about putting the unfortunate hen in the stew pot. Luckily just when I began to consider buying another hen to provide enough eggs for breakfast and to keep up with Teenage Daughter´s prolific baking, Bustle surprised everyone by producing a beautiful pearly white egg to match her new feathers. After all this drama, things returned to normal until yesterday when I noticed some brown feathers in the coop and Mustard looking distinctly dishevelled. I wish a quick visit to a chicken beautician would sort her out but I´m afraid we must expect fewer eggs for breakfast until her Great Reveal some time in mid April when she will be transformed back to an object of beauty and hopefully begin laying her trademark double yolkers again. How often do you have a really good laugh? One of those laughs that starts deep in your belly and forces its way out, regardless of where you are or who you are with. One of those laughs over which you have absolutely no control, either to stop or even laugh quietly. Any attempt to dam this kind of laugh normally ends in explosive snorting noises which of course only makes you laugh more. That was it, I started to chuckle and shake and then laugh harder and harder. Pretty soon, tears were pouring down my face and while everyone else had a good laugh and moved on to other things, I continued snorting and spluttering through the Salade Montanarde and into my wine glass. Every time I managed to calm down, I would think of the picture and the whole thing would start over again. Luckily everyone at the table found it funny enough to put up with my intermittent giggling and eye-wiping and I eventually managed to gain some control. There is something about laughing like that, that leaves you feeling wonderful and lightheaded and puts you in a tremendously good mood. Even remembering it brings a huge smile to my face. Apparently, laughing is very good for you, it raises your heart rate, releases tension and even burns extra calories. I might suggest it to my personal trainer, instead of some of the more unpleasant exercises he gives me. On the flip side, it can be fairly uncomfortable being with someone who has the giggles and you either don´t see the joke or don´t know what they are laughing about. This has happened to Husband on a couple of occasions when we have been on a flight and I have started laughing at a book I have been reading. The need to keep quiet has made the whole thing worse and I have ended up snorting and hiccuping with tears pouring down my face while he has looked on aghast and tried to help by handing me tissues. I suspect that we are hard wired to find any form of loss of control uncomfortable viewing, whether it is crying, shouting or even unstoppable laughter. People seem to look away whether out of embarrassment or to give the person crying/shouting or giggling manically some privacy. I can still remember most of the occasions when I have got the giggles and generally what has started me off roaring with laughter, can still make me titter today. Sitting on a chairlift with a friend who insisted that one of her colleagues was called Hugh Janus (say it quickly to yourself) and my subsequent inability to stop laughing for two days. Or the time someone broke wind loudly in a extremely serious school assembly. These are all memories which can bring a smile to my face and even make me laugh out loud years later. 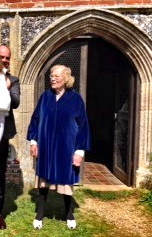 So I am going to treasure the picture of the christening and take a quick look at it every so often to keep my blood pressure down and fool myself that I am burning calories as I chuckle.